Keep everything organized when you head out of the house with this trendy and beautiful bag. With western-influence, this bag is accentuated with stitch accent and tassel detail exuding a touch of class in every move. The exterior is made from premium faux leather making this bag durable and will look stylish for years. Split compartment interior with multiple pockets inside and out will give you more storage and organizational space. The center zip pouch ideal storage for your wallet and receipts. The inside zip pocket easy access your phone. The conceal carry pocket at the back could store a 5-inch smartphone while the slip pocket next to it can hold your keys or a lip balm for easy access. Suitable for any casual occasion and perfect for weekend strolls around the city. 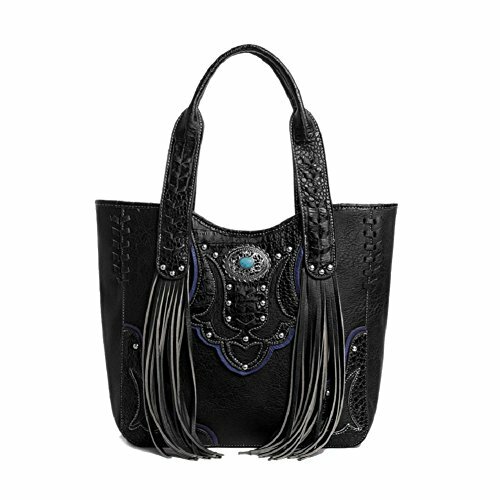 Redefine your style with this elegant western-inspired purse with stitch accent and tassel detail that gives more style! Embellished with studs and blue stone on the exterior. Zippered top closure to ensure the safety of your valuables. It has spacious compartments to keep all your essentials organized. Fabric-lined split compartment interior. It has multiple pockets inside and out to give you more storage space for your everyday essentials - A center zipped pouch, inside zip pocket on the back wall. A slip pocket and the conceal-carry pocket both can be found at the back of this purse. Measures 12 inches long X 12 inches tall X 5 inches wide X 9 inches drop. If you have any questions about this product by Cowgirl Trendy, contact us by completing and submitting the form below. If you are looking for a specif part number, please include it with your message.